Jul. 20, 2018 6:30 a.m.
Artists from Vancouver Island and BC’s coastal islands responded in force to the 2018 Sooke Fine Arts Show call to artists. As always, the show’s adjudicators have a tough job on their hands, sifting through the applications to narrow down the field of artists to 260. Those selected will see their original fine art exhibited in categories such as 2D, 3D, photography, fibre, ceramics and hand-formed jewelry, while several judged as the best will take home cash awards for outstanding artistry totalling over $12,000. 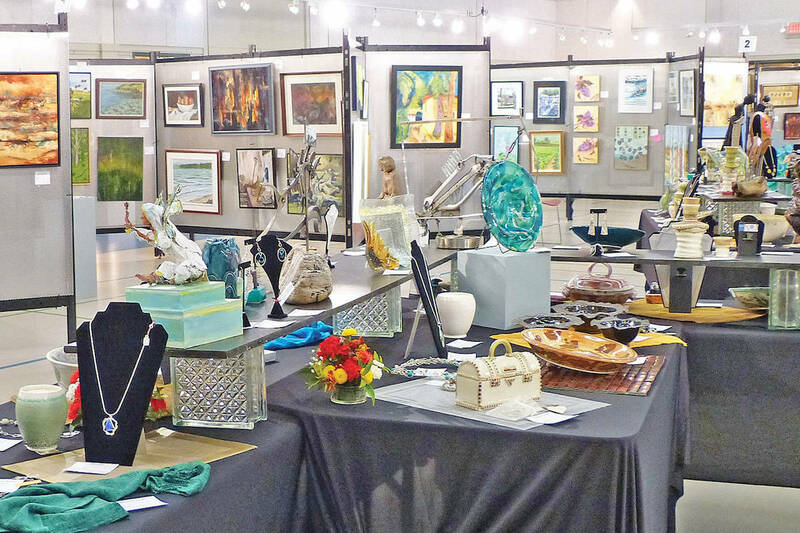 From July 27 to Aug. 6, the Sooke Fine Arts Society rolls out the carpet to art lovers from far and wide at SEAPARC Leisure Centre in Sooke, where the arena has been beautifully transformed into a 16,000-square-foot gallery displaying 380 original works of West Coast art. The society expects to greet more than 8,500 attendees during the 11-day celebration. Daily events provide a multi-faceted experience incorporating live music, art demos, lectures and activities for children, youth and seniors. Along with a chance to see the juried world-class fine art, a gallery gift shop displays smaller works, and the youth gallery proudly features art created by talented students from three regional high schools. While the show provides all of the benefits associated with the arts, including a wider perspective of the world through artists’ eyes and a sense of connectedness, it is also a local economic driver and a great source of public pride. With the participation of 300 volunteers who do everything from construct and light the gallery, design the show and run the activities, it reflects the character and pulse of the community that inspired the first show in 1986. “After 32 years, there are many colourful and inspiring stories attached to all who have been involved with the Sooke Fine Arts Show and those stories have become part of its history and legacy,” says society executive director Christa Brenan. Brenan notes the phone starts ringing in January with inquiries from people wanting to book their summer vacations to coincide with the Fine Arts Show. That, and “to purchase tickets to the Purchasers Preview Night – long before tickets are printed,” she says. The ever-popular preview night happens July 26 from 7 to 10 p.m., ahead of opening day for the main show. For more information on the show, visit sookefinearts.com.